Everyone loves potted indoor plants. There are so many kinds of plants that do well indoors but today we are going to talk specifically about tropicals. 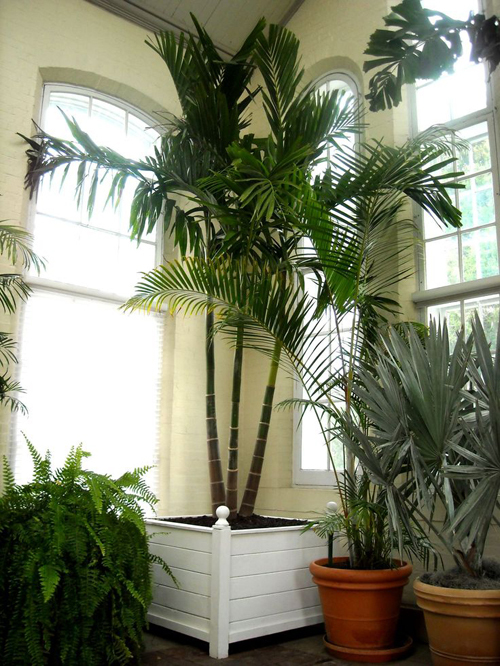 Potted tropical plants are pretty easy to grow indoors and require little attention. 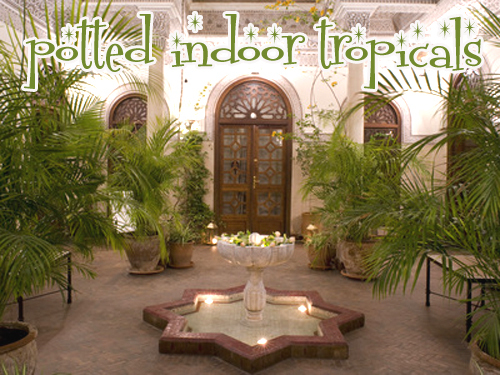 When you would love to bring a touch of paradise to your home then give these potted indoor tropicals a chance. Of course it bears repeating that if you have small children or pets in your home you need to research or contact your poison control center to make sure that the plants you pot and place in your home are safe. 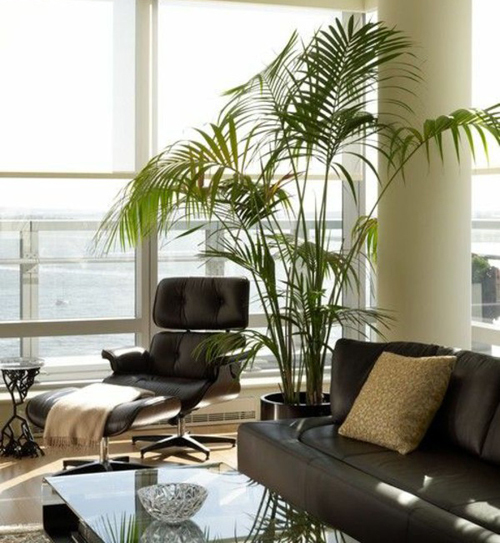 Palms: Palms are stunning when potted and placed in your home. They range from small pygmy size to large impressive sizes that can fill out a empty corner where color, size, and some life is required. Potting them up in colorful planters will add that tropical touch that you may desire. 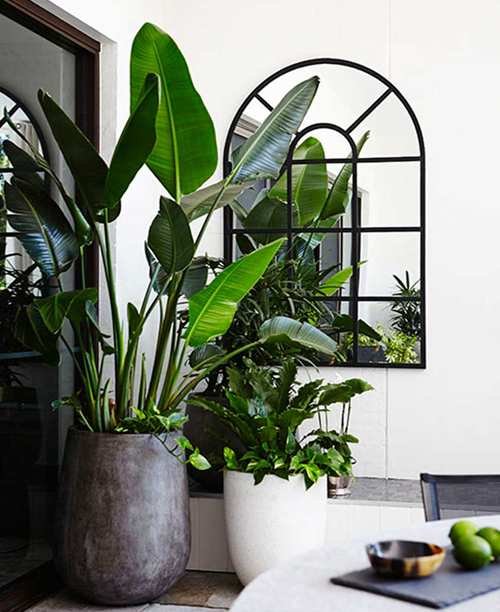 We like the Miami Vice look of using monochrome planters like white or black with palms to create a contemporary and modern look. Potted palms like warm air but not drafts. They like moist soil but not sitting in water. Don't over water and keep in sunny spot. Bird of Paradise: Talk about impressive! These plants are easy to grow and don't require a lot of fuss but boy are they elegant. With or without the colorful bird shaped flowers these plants have large fan like palms. Flat, wide leaves bring you back to Cleopatra days where they were used to fan the queen. Perfect to adding a deep green to your homes interior and a tropical feel to the decor. Make sure they have lots of light and space. You will need to repot yearly if you have space because they grow rapidly. Use a poly resin planter if you prefer to replant every other year. They are flexible and have some give that will let you extend the potted life of the plant. 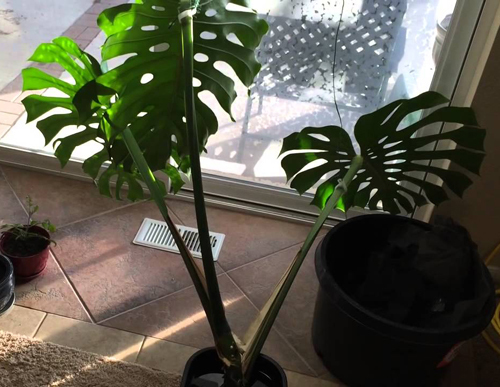 Philodendron: These are pretty common as a potted indoor plant. When the plant gets larger the leaves turn into a split leaf saucer shape that is balancing on the stem. Just stunning! Warm without drafts, moist but not sitting water and misting every couple of days will keep these high humidity plants happy. Wipe the saucer leaves with warm water to keep free of dust and mites. You will have to transplant every other year so make sure you have the room. Since these are dark green with huge flat leaves, try using terracotta or tuscany clay planters. The clay will breathe creating a healthier environment for this potted palms root system. So don't let the fact that you don't live in a tropical climate stop you from creating your own indoor potted paradise. Do your research, find the perfect spot. Pick our amazing potted to act like the foundation of your palms and give it a go. Potted tropical plants are elegant,amazingly beautiful, large and impressive and will always add a sense of luxury and drama to your home. [Read More] How to moss cover clay flowerpots. [Read More] Orchids at home. potted indoor palms, tropicals for indoors, potted tropicals for indoors.